The in-house pilot plant tests the functionality of the Whirlwind system with the individual customer products. To restore quickly optimal production conditions, Ruland offers up-to-date cleaning processes and CIP systems, tailored to individual requirements. 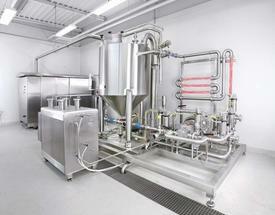 The modular CIP equipment is available in classic design or in a compact layout. All cleaning parameters are optimally designed for cleaning. Whirlwind is a technology for the clearing and cleaning of piping systems with air. In a multi-stage process, a whirlwind is produced that clears and cleans piping systems. To ensure even better cleaning results, water or cleaning agents can be injected into the airstream. Whirlwind can also dry the piping system in a following step. The Whirlwind technology is applicable with water-like and highly viscous materials. The operator of the customized system profit from low water consumption, short mix phases and reduced product loss. Furthermore, if required, Whirlwind can be used for several plants with different pipe diameters. It is easy to integrate this technology into existing plants. The functionality and effectivity of the Whirlwind with the individual customer products can be tested in an in-house pilot plant at Ruland. If you have any questions or need a quote request information now!